Walk to the “designer” wing in the V&A Shopping Centre where you’ll satisfy all your shoe and clothing desires at Prada, Armani, Chanel, Louis Vuitton and Gucci, amongst others. For the most heavenly sushi, try Willoughby & Co in the V&A Shopping centre for a menu that will impress the most seasoned travellers. By now its time to take a boat cruise around the harbour, warming up afterwards with coffee and croissants at Love, Revenge & Cappucino. 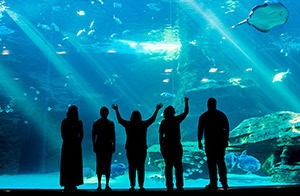 Located in the V&A Waterfront, the Two Oceans Aquarium makes for a fascinating and exciting visit for the whole family, the Two Oceans Aquarium is one of the top tourist attractions in Cape Town and over 3000 living sea animals, including sharks, fish, seals, turtles and penguins can be seen in this spectacular underwater nature reserve. Sandy B is the private beach club of The Bay Hotel. Overlooking the popular Camps Bay Beach, it provides an incomparable vantage point from which to enjoy the magnificent sunset. 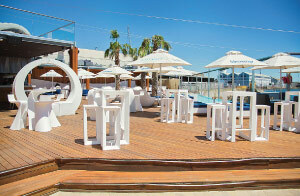 It is a stylishly relaxed venue complimented by the pure aesthetics of the décor. 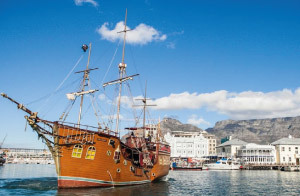 It’s the ideal location for Cape Town’s sun kissed socialites and bronzed beauties to lounge on the private deck, revel in the sunshine, cool off with a refreshing dip and indulge in a glass of chilled champagne. Please enquire at Waterfront Village reception for details. Explore the beautiful working harbour and the peninsula from the waters on a boat, high speed jet boat, yacht or catamaran. For a memory to last a lifetime, the sunset champagne trips to Clifton or Camps Bay, will remain etched on the mind. Tours depart throughout the day, taking visitors on short or long trips or private charters can be arranged, including fishing charters, champagne cruises and more. 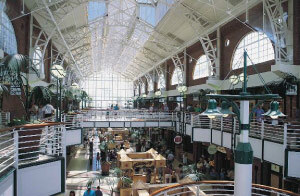 The V&A Waterfront is a shopper’s seventh heaven, offering over 400 retail stores. Highlights include a “designer label” wing situated in the Victoria & Alfred Mall, featuring designers such as Gucci, Prada, Louis Vuitton and Burberry. Sure to satiate a shopping spree fix, the Waterfront showcases stores stocking everything from Aston Martins to Apple Macintosh, Manolo Blahnik’s to Louis Vuitton bags. Whether you’re looking for a venue to wine and dine the night away or somewhere to enjoy the sunshine with a cocktail in hand, you’ll find your pleasure at Shimmy. The restaurant offers a number of delectable menu choices and the stylish bars present a variety of drinking experiences. 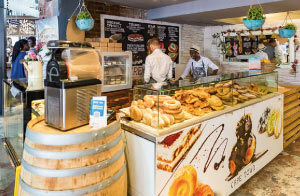 The V&A Market on the Wharf is a premium fresh food destination situated in Cape Town’s world-renowned V&A Waterfront and is South Africa’s latest and most tantalizing fresh food and produce market. 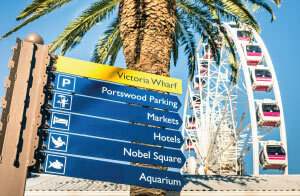 Open 5 days a week at Africa’s hottest venue – the V&A Waterfront in Cape Town, its motto. 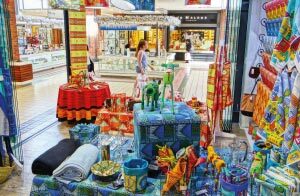 The Watershed Craft Market opened in June 2014 as an exceptional space characterised by High glass ceilings with light and airy walkways. Product offerings range from leather goods to high quality African curios.